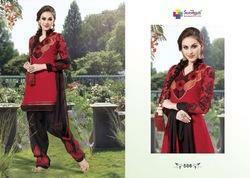 We are leading Supplier, Trader, Wholeseller and Exporter of Salwar Kameez. Our interesting collection of garments makes us to manufacture, exporter, trader of Designer Wedding Salwar Kameez. This collection is perfectly stitched by our tailors by using excellent quality fabric and latest machinery. Our fashion designers keenly design this range without compromising with quality. Our regular customers can easily buy this collection at reasonable rates. We are the Leading Supplier,Trader and Wholesaler of Embroidery Ladies Salwar Suits in Chennai,Tamilnadu,India. We are the Leading Trader,supplier and Wholesaler of Awesome Dress Collection in Chennai,Tamilnadu,India. We are the Leading Supplier,Trader ,Exporter and Wholesaler of Daily Wear Salwar Kameez in Chennai,Tamilnadu,India. We Yaseen Tex Established in the year 1992 at Chennai are among the prominent manufacturers, traders, suppliers, wholesalers and exporters of supreme quality Ladies Suits and Salwar Kameez. For the purpose of designing the offered ladies dresses in compliance with prevailing market and fashion trends, the cutting-edge weaving machines installed at our state-of-the-art infrastructural facility are used. The product range offered by us is inclusive of Anarkali Salwar Kameez Dress materials and Stitched materials and Anarkali Kurtis. These ladies dresses can be customized as per the demands and requirements provided by the customers. In addition to this, these Salwar kameez and Suits are highly demanded among our customers for their vibrant color combination, colorfastness, resistance to shrinkage, appealing design and smooth finish. Offered by us at industry leading prices, these ladies dresses are highly appreciated among our customers. We export our products to Sri Lanka, Malaysia, Canada, UK, Dubai & Saudi Arabia. We supplying globally with minimum to maximum orders. If you are the Business Retailer then its an excellent opportunity to deliver it on your way in a profitable manner.